The 17th Asian Oil, Gas & Petrochemical Engineering Exhibition (OGA 2019) will be held from 18th – 20th June 2019 (Tuesday - Thursday) at the Kuala Lumpur Convention Centre. 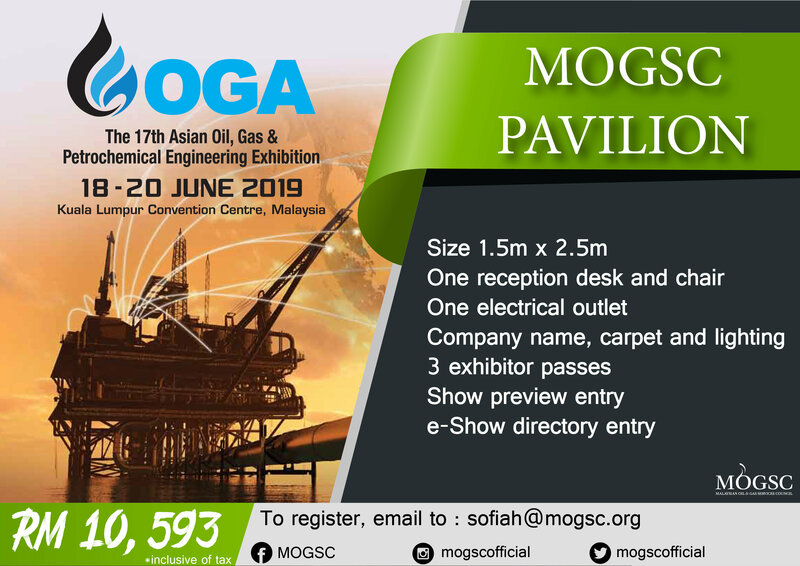 We will once again have a MOGSC Pavilion especially for members at OGA 2019. The pavilion will give the opportunity for members to have a presence at the exhibition for a much lower cost. The location of the MOGSC Pavilion will be in front of Hall 1, Booth No. 101-108 (hall layout). Due to the limited space, we are only able to accommodate 8 member companies at a cost of RM 10,593.00 per booth (inclusive of SST). Please email the registration form to sofiah@mogsc.org by Thursday, 31st January 2019.